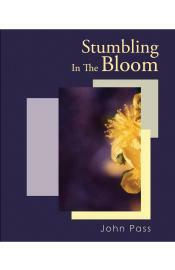 The poems in Stumbling in the Bloom engage the ever-present enticements and entanglements of beauty on life’s, and art’s, home ground—in wilderness and garden. But this surprising volume, the finale of John Pass’s quartet of poetry books, At Large, takes intriguing side trips on the home-stretch, including a wry excursion to the chiropractor, a fanciful flight from a student driver’s parallel parking practice, up an “Everest” in Alberta, and on a singularly moving Canadian journey towards and away from the “ground zero” of the 9/11 tragedy. The book, and Pass’s aesthetic, come to rest finally on a fulcrum, a paradox, of acceptance: the embrace of uncertainty and (un)happy accident that purpose and effort alone make possible.